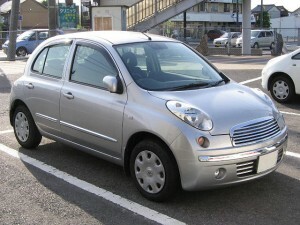 First sold on the Japanese market in 2002, the Nissan Micra K12 made its way to Europe in 2003. Completely redesigned from its predecessors, the K10 and K11, the wheelbase was 70mm longer, and the exterior much curvier. Overall, the vehicle was both taller and wider, and its most defining feature was the unmistakeable headlamps that extend all the way up to its wing tops. The K12 remains one of the most popular ‘budget’ cars that Nissan has produced, and many people still hang on to these old models as their favourite vehicles. It is easy to see why this car is the darling of the Micra range. Here are some of the pros and cons of this reliable hatchback. ABS with electronic break force assistance, combined with the Nissan Brake Assist. A word of warning though, these breaks are extremely strong and can bring you to a complete dead stop, so drivers have to mindful of those around them. For such a small car, the K12 has ample storage space in its interior. The rear seat slides back and lies down, providing either leg space or storage space. There is a removable bin under the passenger seat to store miscellaneous items, and a big compartmentalised glove box for the rest of your stuff. The car itself drives relatively well, with a tight turning circle and easy handling. The top speed for the 1.2 is 95 mph and it has a fuel consumption of 48.7 mpg, which makes it relatively economical. The biggest problems with the K12 have been a stretched timing chain, which can cost around £1,600 to replace, and there have been malfunctions with the intelligent keys. Both of these problems are relatively avoidable if the car is serviced regularly, about every 10,000 miles or 12 months, whichever comes first. However, once these problems have started to surface it becomes very expensive and relatively unlikely that the K12 will ever run like new again. Therefore many of these cars are starting to be scrapped. If you own a Nissan Micra K12 and it’s now experiencing problems with the above issues or any other reoccurring faults, it may be time to consider scrapping your beloved motor. Give Scrap Car Kings a call today and we will give you a quote for your vehicle and will make the scrapping process hassle-free, leaving you with more time and money to find a replacement vehicle.